Earlier, we saw, how India's trade with Rome was affected, around the beginning of our era, by the raging wars between Satavahana empire and Indo-Scythian Kshatrapa, Nahapana's forces and how the ships calling on Indian ports had to shift their port of call to Choul in the south. This necessitated a new trade route up the Western Ghat mountain range through the Pimpri ghat (Tamhini Ghat of present), to the main commerce centre of that time, located in Junnar town. This also meant that the trading boom town of Dhenukakata was located somewhere along this route. We therefore should be able to reject this identification easily. Now we move to another identification. In an article titled as “ Two Notes on Ptolemy's Geography of India,' written in the “ Journal of the Royal Asiatic Society” published in 1941, E.H. Johnson had proposed that the port of Dounga that appears in Ptolemy's list, or the modern day “Dongri” village on the Salsette island must be the town of Dhenukakata. I find this identification as most exciting, because Salsette island is none other than the present day city of Mumbai, which is considered as commercial capital of India. The idea that even 2000 years back, Mumbai was a large trading community, which included many Greeks, is really heart warming. Unfortunately however, this identification also can not stand true. I have mentioned before that the ancient Greek text “Periplus of the Erythraean Sea.' says clearly that the city of Calliena (Kalyan), which in the time of the elder Saraganus (Satavahanas) became a lawful market-town; but since it came into the possession of Sandares (Kshatraps or Nahapana's forces), the port is much obstructed, and Greek ships landing there may chance to be taken to Barygaza (Bhadoch) under guard. If the readers refer to the Google earth images I have posted here, it should be clear that ports of Kalyan and Salsette island are in the vicinity of each other and if Kalyan port was not available for Greeek ships, it is unlikely that Salsette island could have been available to them too. The entire area around these ports must have been a hostile area in possession of Nahapana's forces and no trading community, trading with Satavahana empire could have existed there. There is one more point which goes against Salsette island's identification as Dhenukakata. The shortest route to the commercial center at Junnar from salsette is same as that from Kalyan; the one through Naneghat mountain pass. In the vicinity of this route, there were two monasteries. One at Kanheri and a big one near Junnar. In Junnar caves, there is no mention of Dhenukakata any where at all, and in Kanheri, Dhenukakata is mentioned in just one inscription. This virtually rules out possibility of Salsette island or Mumbai being identified as Dhenukakata. The above argument also rules out Dahanu ( a coastal village north of Sopara) as a possible identification because any route from Dahanu to Junnar had to pass through hostile areas near Kalyan and also Naneghat mountain pass. It is difficult to accept this argument at all, as, if this one is accepted, we would have had found names of Dhenukakata and Umehanakata donors in all other nearby Monasteries such as those at Bhaje, Kondane, Bedse and Shelarwadi. But that does not happen and these names occur only in Karle'n monastery but for a solitary exception in Shelarwadi. D.D.Kosambi identifies Junnar with the city of “Tagar” mentioned by Ptolemy and in the Periplus (McCrindle's Edition, 126). 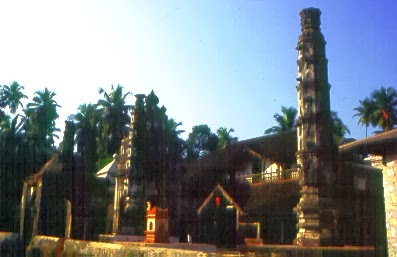 It was an important commercial town with trade links not only with Bhadoch in the north but also with Masulipatan on east coast of India besides Pratishthan (Today's Paithan) that was the capital of the Satavahanas.However, Periplus clearly mentions that the city of Tagara is about 10 days walk to the east of the Satvahana capital of Pratishthan ( present day Paithan.) This rules out Kosambi's argument of Junnar being called as Tagara in the past. 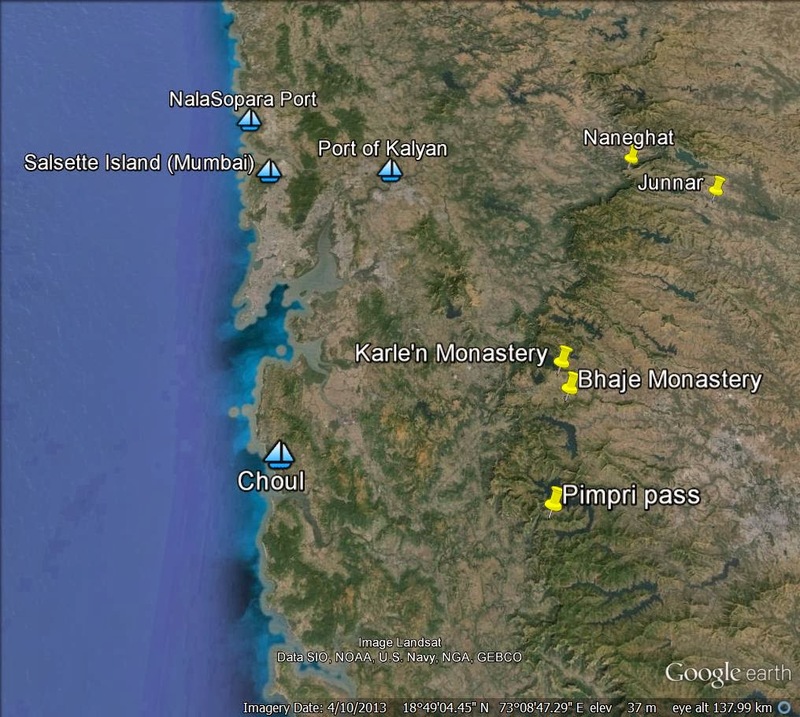 Considering all of above arguments, it becomes clear that we can not identify any of the existing major towns nearby Karle'n Monastery, with Dhenukakata. Does this mean that this once prosperous trading community has been ground to dust or has gone into oblivion? Looking at the geographical situation near about Karle'n caves, where a thriving monastery once existed and the trade route that passed near by from Chaul port on the coast, to Junnar city via Tamhni Ghat pass, I am tempted to make an educated guess that perhaps the legendary trading community could have existed in the flat lands between the Karle'n Monastery to the north and Bhaje Monastery in the south. Several villages and towns are located here. Major being Karle'n, Shilatane, Devghar, Wakasai and Dongargaon. 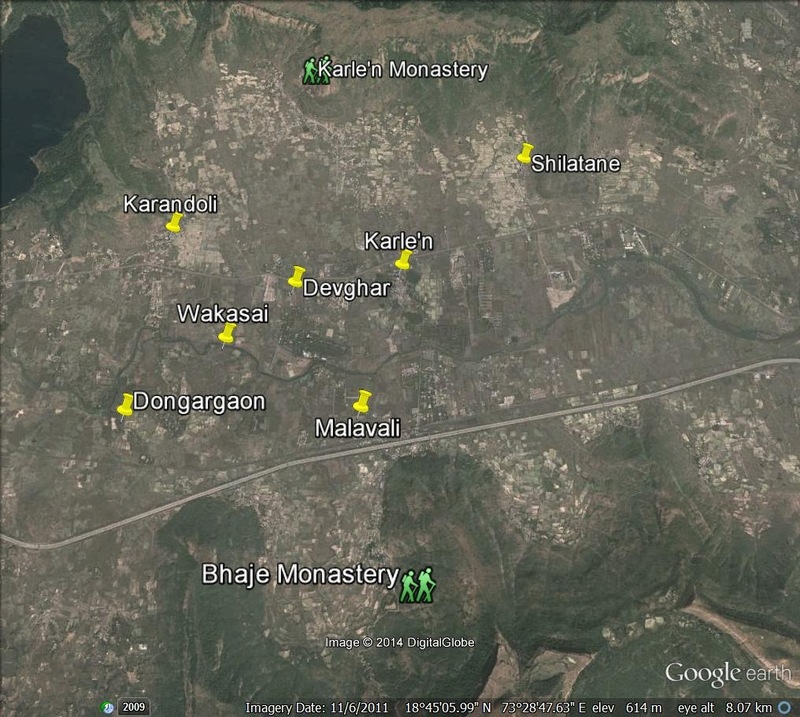 Could any of these little villages be identified with the trading community of Dhenukakata in the past? 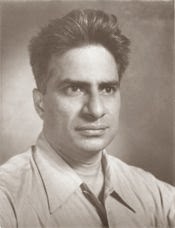 In the year 1955, writing in a research paper, published in the Journal of the Bombay branch of the Royal Asiatic society, an eminent scholor, Damodar Dharmananda Kosambi, a mathematician, statistician, Marxist historian, and a polymath who had contributed to genetics by introducing Kosambi's map function, claimed to have solved the riddle and found the legendary trading community of Dhenukakata.